Carolina Dune Buggies is a full-service dune buggy, sandrail, kit car and VW business. We can provide everything needed to build a complete car. In addition we can perform custom turnkey project builds to your specifications. If you are interested in building your own custom dune buggy, sandrail or kit car and have a good set of tools, work space, mechanical knowledge and a few weekends, we can help. We can supply chassis, suspension components, transmissions, engines, and all the little odds and ends to make your project stand out. Carolina Dune Buggies is a Master Dealer for Acme/Berrien Buggy products. Which Chassis Do You Need? Step 1: DIY or Turnkey? “DIY” Knockdown and Tacked kits: Berrien offers three styles of tacked “project” kits – the Knock Down, Side By Side and Top & Bottom. For all kits, you’ll need access to a welder (preferably MIG or TIG), level, tape measure and a 4 1/2” angle grinder. Knockdown: Our “knockdown” kits (2 seat Warrior and 4 seat Cruiser) are by far the least expensive to buy and ship, but they require the most assembly. These consist of a tacked floor section, with all other assembly to be done by the customer. This is a true build it yourself kit with a little head start done for you. Side By Side: Our “side-by-side” models are offered to provide for the least expensive shipping costs almost anywhere in the world. 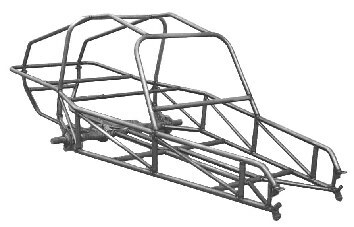 The kit consists of the two chassis side assemblies (arm rails and bottom rails, with all uprights and diagonals) tack welded together, as well as the front floor center section (front and rear crossbars with two center bars), and includes a box containing the rest of the tubes for the upper roll cage and rear cage sections. This kit is a little more challenging to put together, and you should have an assistant to help with assembly, but it ships flatter for better cost savings. Top & Bottom: Our “top-and-bottom” kits are designed for ease of assembly, but may have a higher shipping cost. The entire floor of the chassis is tack welded together and the upper roll cage comes assembled. The only thing the customer needs to assemble is the side “uprights and diagonals”, as well as the rear cage. One person alone can easily complete assembly. While this kit CAN be shipped, it is recommended to pick up your “top-and-bottom” kit at Carolina Dune Buggies. We also offer fully welded chassis. These require the least amount of assembly, but some welding is still required (ie., seat belt tabs, steering bearing mounts, pedal mounts, shift box, etc.) Fully welded chassis are the most costly to ship and it is recommended you pick up your fully welded chassis at Carolina Dune Buggies. If you are not mechanically inclined, we can walk you through the step by step process of selecting components for your turn-key build; once selected, we will do the work for you. Our mechanics have been working on dune buggies and Volkswagens since 1968 and we use only the finest parts from well-known suppliers. Please call for details and quotes. 4-Seater Dune Buggy Style: The 4-seater style fiberglass dune buggy body fits a standard size VW Beetle chassi without modification. The wheel base is 94 1/2″ which provides room for two adults in the front, two adults in the rear and a small bench seat suitable for small children or luggage. An example of the 4-seater style dune buggy body is our Berrien Genesis fiberglass dune buggy body. 2- Seater Dune Buggy Style: The 2-seater fiberglass dune buggy body fits a shorten VW Beetle chassis. The chassis is shorten 14 1/2″ making the total wheelbase 80″. This style provides room for two adults in the front and a small bench type rear seat adequate for smaller children or your luggage. An example of the 2-seater style dune buggy body is our Berrien Nostalgia or Lancer fiberglass dune buggy body. 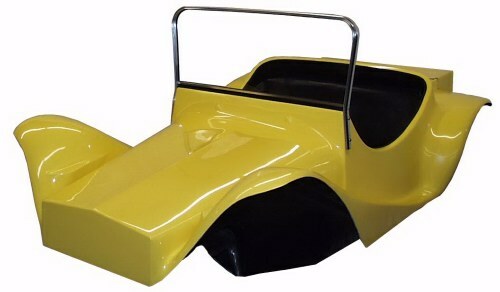 Mini “T” Dune Buggy Style: This 2-seater fiberglass dune buggy body resembles a miniature “T” model or “T” type truck. This style dune buggy body fits a shorten VW Beetle chassis. The chassis is shorten 14 1/2″ making the total wheelbase 80″. An example of the 2-seater style dune buggy body is our Berrien Roadster “T” fiberglass dune buggy body. Turnkey Tube Chassis Kit: This option saves lots of time and headaches. The Berrien pre-built tube chassis from Carolina Dune Buggies is exceptionally strong and includes a thick gel-coated fiberglass floor pan which does not need painting and is not susceptible to rust out as is the original VW pan. It is built the correct 80” wheelbase and needs no modification to fit most fiberglass dune buggy bodies. It also allows tunnel access from underneath which you do not get with a stock chassis. The chassis is made of square tubing, with a 2″ main frame & 1-1/2″ infrastructure, adding an extra 1-1/2″ of lift to the body for increased tire clearance. It features body mounting holes that are pre-drilled, sealed and recessed so that the bolts do not protrude below the chassis. The clutch cable tube, master cylinder mount, pedal mount and seat track mounting brackets are all factory installed, as well as the four front clamps that are welded to the chassis. In addition, the fiberglass floor is pre-drilled and bolted in place. DIY Chassis: If you have enough time, tools, a workshop large enough, a welder and mechanical experience, you can build your own chassis from a VW Beetle pan. The fiberglass dune buggy chassis is based on a standard VW Beetle pan which has been shortened 14½” and welded back together. This includes shortening all center tunnel tubes, cables, fuel lines and the shifter rod. There are several different ways to shorten the VW chassis with some being much stronger as well as more difficult than others. Straight Cut: Not very strong and floor pans require ‘darts’ for outer edges to match up. Diagonal Cut: Stronger but floor pans require beating to get floor edges to meet up. Stepped Cut: Stronger still and makes neat job of floor pans. ‘Volkswagenwerk’ or “Z” Cut: Even stronger method advocated by Volkswagen in September 1969. Step 2: How Will Your Vehicle Be Used – Street, Sand, Woods, Show, or Mixed-Use? In most states, dune buggies, sandrails and kit cars can be made street legal. *Check with your local DMV for applicable laws and requirements. Deciding which use you intend for your buggy will guide your decision making process along the way. It is very important to make this decision up front since certain suspension and drivetrain components will work better for some uses than others. For street, show, and light off-road use, the newer style suspension combinations (Ball-joint front/IRS rear) will be more effective offering a smoother ride, better steering and control. However, these newer style suspension designs are more prone to failure under very heavy off-road use. For moderate to heavy off-road use, earlier designs (Link-and-kingpin front/Swing axle rear) offer near-indestructible operation. The drawback, however, is these older designed suspensions lack somewhat in ride smoothness and on-road performance; they can be more subject to over-steer and rear wheel hop. Having a “donor” car for parts can be the most economical way to build a dune buggy or sandrail. Most chassis and suspension components can be taken from the “donor” car to build your new buggy. Our tube dune buggy and sandrail chassis are designed to use the suspension components from Volkswagen (Type 1) Beetles up to 1977 (excluding Super Beetle—rear torsion housing from a Super Beetle can be used, but the MacPherson strut front suspension is incompatible with our chassis). 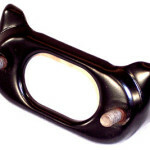 Front torsion-leaf spring suspensions from pre-1965 VW Beetles were of a link-and-kingpin trailing arm style. 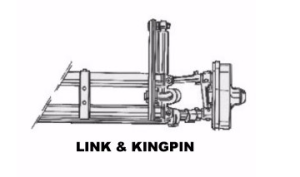 The easiest way to identify a link-and-kingpin front suspension is to look at the upper shock mounting location which is a straight vertical tower and the shock bolt runs horizontal (parallel to the ground). 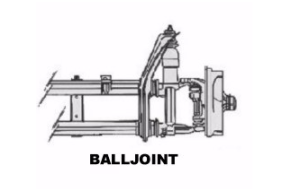 Front suspensions from mid-1966 until 1977 were of a ball-joint trailing arm style. On the ball-joint style the shock towers are angled at the top and the shock upper mounting stud goes through the shock tower vertically. VW Beetle rear suspensions up to 1968 were a swing axle torsion bar style. The axles pivot only at the transmission, causing a substantial camber change as the wheel moves through its travel (the tires seem to look pigeon-toed). 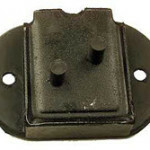 The easiest way of identifying a swing axle torsion housing is to look at the spring plates connected to the axle. They are about 16” long, and have three bolts that connect the axle housing to the spring plate. Rear suspensions from 1968-on VW Beetles were an Independent Rear Suspension (IRS) style, using Constant Velocity (CV) joints at the transmission and also at the wheel. This allows the wheel to move through its suspension travel with minimal camber change (the tires contact the ground flatter). Identification of an IRS torsion housing is made again by the much shorter (10”) spring plates, and the presence of trailing arm “pockets” or clips, at the junction of the torsion tube and the frame horns. Within the years of the independent rear suspension, it is also important to know the front transmission mounting style. In pre-1972 VW Beetles, the nose cone of the transmission mounted with a two bolt rubber and steel mount. 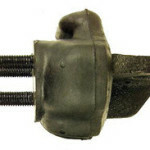 The bolts mating this rubber mount to the torsion housing ran horizontal (parallel to the ground), and the steel mount on the torsion housing was oval-shaped, with a center hole. From 1973 to 1979, the nose cone of the transmission mounted with a three bolt rubber and steel mount; the torsion housing had two studs that pointed vertically (directly at the ground). Once you have acquired your VW Beetle “donor” car, it is best to examine its components very carefully. Decide what can be salvaged to use on your new buggy as some components can be VERY hard, expensive or even impossible to find new. For instance, most of our fiberglass dune buggy bodies are designed to be used with a stock VW steering column and these are getting harder and harder to find. We have parts available to rebuild columns, but the steering shaft itself is not available new. There are other options such as chrome hot rod style tilt steering columns but these can be expensive as well. Any parts on your car that are usable should be saved until the completion of your buggy. 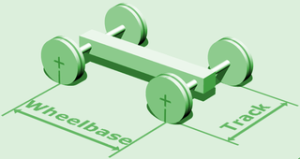 Step 4: How about Wheelbase? Once you have decided on your buggy’s intended use and the suspension combination, it is time to select a chassis. The wheelbase is determined by measuring the length of the car from the center of the front wheel to the center of the rear wheel. The wheelbase of your chassis an important consideration. The universal rule of thumb is, “The longer the wheelbase, the more stable the car will be. The shorter the wheelbase, the better the cornering ability will be.” For tight cornering and woods running, a shorter wheelbase is necessary, to allow for quicker drivability around obstacles without having to back up. However, on sand and in wide-open spaces, a shorter wheelbase can be a deterrent to stable operation. A longer wheelbase, where cornering is not a concern, can add a safer feel to the ride. Carolina Dune Buggies offers fiberglass dune buggy chassis in an 80” wheelbase and sandrails in wheelbases of 90”, 95”, 100”, 105”, 112”, and 115”. Wheel track width is another thing to take into consideration. Wheel track width is the width of the suspension, measured from the centerline of the wheel to centerline of the other wheel on the opposite side of the car. The wider the wheel track, the more stable the car will be but you will sacrifice some ability to fit into a “tight squeeze” situation since the chassis will be wider. Carolina Dune Buggies offers dune buggies and sandrails in the stock VW width, or (for a small additional charge on certain sandrail models) 6” wider. Adding 6” to the width also adds to the cockpit width, allowing for larger, more comfortable seats and storage. Step 5: Cockpit and interior dimensions. At this point, you should have decided on the purpose of your dune buggy or sandrail. Now it is time to consider the comfort level you desire. The best way to do this is to decide which type seats you are planning to use. Once you have purchased your chassis, it is a good idea to try to find seats that will fit into your chassis arrangement. You may actually want to go to a dealer near you, and sit in one of the seats. You will need to have an assistant with you, because you need to measure not only the seat, but you, and any intended riders who may be larger than you, sitting in the seat. You will want to sit in the seat on the floor (or, if you plan to use seat tracks, on them) and measure from the floor to the top of your head. If you plan on wearing a helmet in the car, make sure to bring it with you, and take your measurement to the top of the helmet. You need a minimum 2” of clearance between you and any part of the cage. You should want to compare your measurement with the stated height dimensions on our product pages to make sure the cockpit is high enough for you. Measurements on our product pages are measured from the lowest part of the bottom floor rails to the highest point on the bottom of the top rails. If you plan to mount your floor and seats ABOVE the bottom rails, subtract 1 ½”. Carolina Dune Buggies offers sandrails with an additional 3” of height from stock for no extra charge, but if you need more than 3”, give us a call, and we can get you a price quote for a custom height. 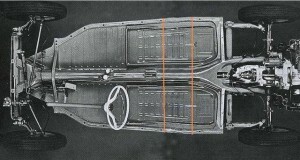 Stock cockpit width is measured at the widest point of the cockpit (inside dimension). Again, for an additional charge, certain sandrail chassis may be widened 6”. Fiberglass dune buggies normally require seats which are 18”-19” wide. 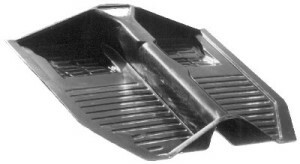 These can be mounted on thin slider mounts which can be bolted directly to the floor pan. Seats wider than this will require the seat to be mounted on a raised base which can place the person sitting in the seat above the windshield. Step 6: Call Carolina Dune Buggies and place your order! Remember to have all your suspension, height, and width information ready, and also any other questions you may have. We are happy to help your get you buggy ready and on the road!